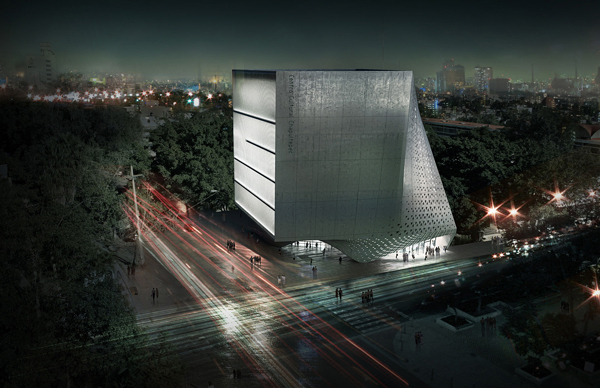 Thoughtfully designed as a singular form, the competition entry for Cultural Center in, Mexico, by collaborative design team consisting of architects Adrian Yau, Frisly Colop Morales, Jason Easter, and Lukasz Wawrzenczyk merges the concepts of aesthetics and functionality. The aim was also to create a landmark piece which would eventually become the icon of the city, through subtle yet dynamic form and composition. Simple in its presence and materiality, but monumental in form, the building of Cultural Center seeks to create a city focal point that adapts to the surrounding, establishing itself as the heart of the local community. In order to provide informal gathering spaces for students, the existing 1970 building of The State University of New York at New Paltz needed expansion. Designed by Ikon.5 Architects, The Campus Commons project is a steel and glass winter garden, a smooth addition to the existing Student Union building. The new structure is spanned over an existing exterior courtyard so the exterior space is successfully transformed into a pleasant university living room. The new space provides plenty of room for informal gathering, food courts, multi-purpose meeting rooms, a bookstore, student offices, entertainment center and meeting rooms. The design implements new environmental strategies in order to achieve a LEED Silver certification, such as day light harvesting, radiant heating and cooling, recyclable materials and photo optic lighting controls. NBBJ designed Amazon’s Seattle Headquarters in 2012, but now they added three biospheres to as the “heart” of its high-rise complex in Seattle’s Denny Triangle. 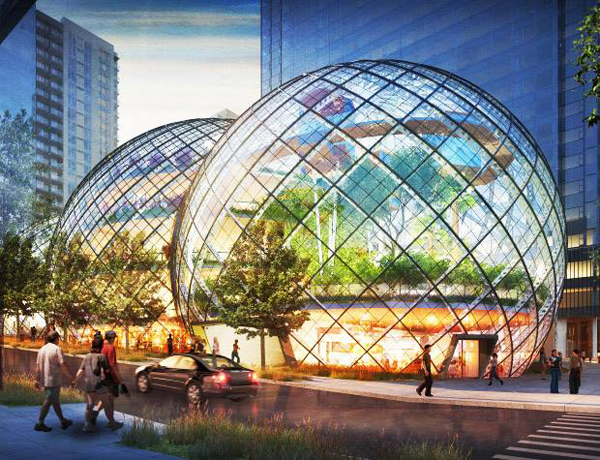 Planned for employees only, the bold-designed spheres drew instant reaction, from online comments and at a public hearing before a city design review board. Each sphere features five floors of flexible work space totaling 65,000 square feet and would be capable of accommodating mature trees, according to plans. The height of the spheres ranges from 80 feet to 95 feet. The primary goal was to create the working environment which is more park-like and spontaneous, that a typical sterile office space. 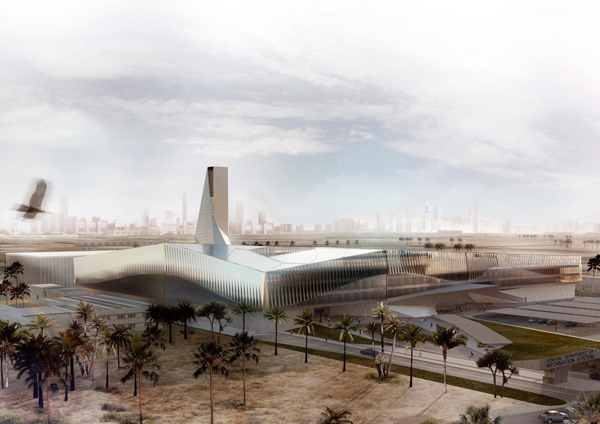 AGi Architects, in collaboration with Bonyan Design, recently won the competition to design the General Department of the Information System in Kuwait. The winning concept is clear in its duality, derived from technology, innovation and transparency on one side and security, due to the fact that the main occupant of the building is Ministry of Interior Affairs, on the other. The building is created in superposition of two contrasting layers and seen from afar, it is floating, elevated from the ground and light in its presence. However, closer approach reveals the massive stone plinth. 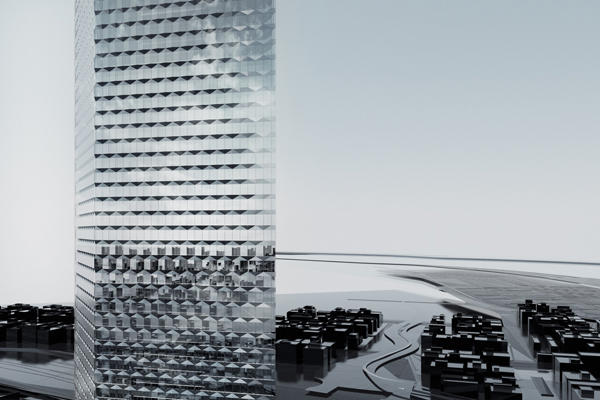 Despite its massive presence, the building is wrapped in transparent glass envelope of the offices, as a second skin which protects the building from the radiation of the direct Kuwait sun. That secondary skin actually creates a new façade, while enabling building’s ventilation. During the day, the façade works as a chimney and at night it is used to cool the building, using traditional methods. The dominant skin is designed in metal louvers with a polished finish, placed perpendicular to the radiation, deflecting the heat from the building, while allowing the views to the outside. The Blade, 300 meter-high landmark piece by Dominique Perrault Architecture, is one of many statement designs chosen to be built and represent the power of the future Yongsan International Business Center in Seoul, whose master plan was designed by Daniel Libeskind. The Yongsan International Business Center, ambitious program of nearly 3 millions square meters, is organized as an archipelago of vertical buildings inter-connected a by large park. A year later, according to Business Insider and several real estate development outlets, the “Dream Hub” as the archipelago was named, is on the verge of collapse. The information is still speculative, but the $28 billion real estate wonder faced difficulties in raising funds, due to the real estate slump and the global financial crisis. 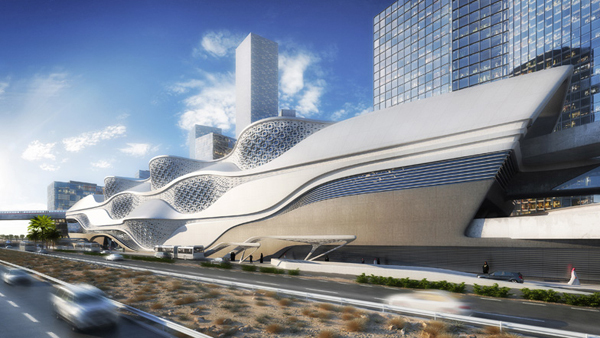 Zaha Hadid Architects won the competition for The King Abdullah Financial District Metro Station in Riyadh, Kingdom of Saudi Arabia. This organic, amorphous metro station will be located on the edge of the Financial District and will serve as a major hub between most important city’s metro lines. 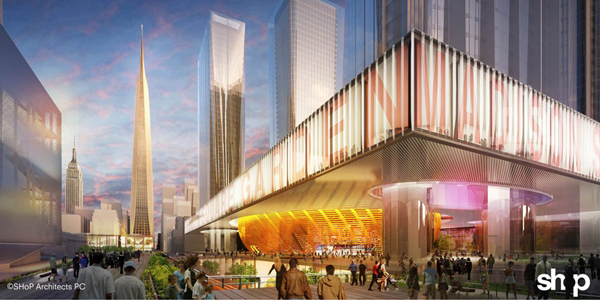 The station will is planned as integrated within the urban context of the district, responding to the functional challenges of one multimodal transport center as well as the district’s future vision. The smoothly curved station spreads over six platforms over four public floors and two levels of underground car parking. The international architectural competition for Central Prishtina Mosque, held in March 2013 still doesn’t have a clear winner. 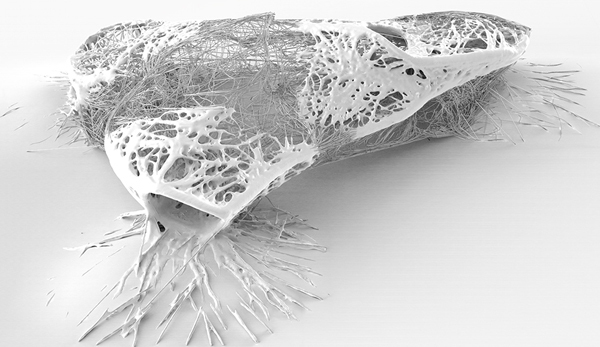 This proposal by OODA + AND-RÉ is one of over seventy entries, and the design is a result of an intense research on the mosque theme, ranging from a profound historical study of cultural heritage, to analyzing the evolution over time, both in program and in the materiality and form, understanding the social and urban factors as well as the different geographical characteristics. 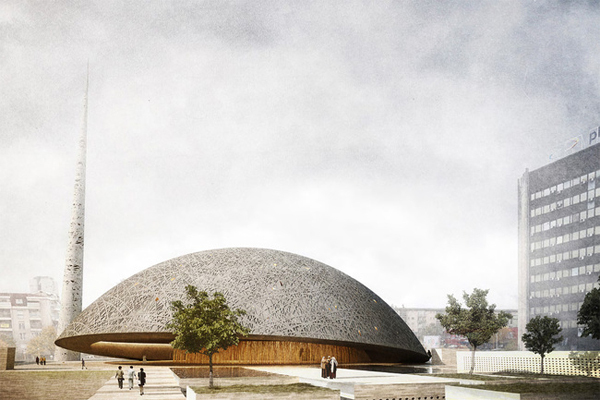 The proposed dome-like mosque is an affirmation of all the values studied, and outcome which is a landmark design in its conceptual, coherent solution and bold, clear and logical structure. Find(&)MERGE by SVEN is a project derived from the research of a coherent strategy, enabled to be implemented regardless of changing conditions. SVEN are Andrea Barbieri, Filippo Conti, Giulia Mariotti and Beatrice Scardovi from University of Bologna, Italy and their aim was to obtain a model that could both fit and change the area configuration where the system acts by exploiting systems of emergent behavior. The project is done following a “bottom-up” approach where the system grows and evolves up to the event of an emergent and self-organized behavior, obeying the simple rule about the interactions of an agent-based system. The external parameters affecting the system are related to environmental and urban planning data. 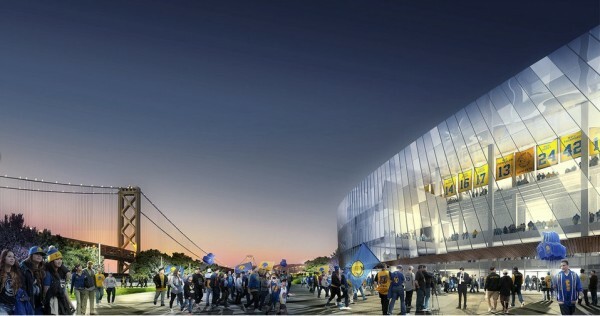 The Golden State Warriors recently announced that Snøhetta and AECOM have been selected as the architecture team to design the Warriors’ new sports and entertainment complex on the San Francisco waterfront. 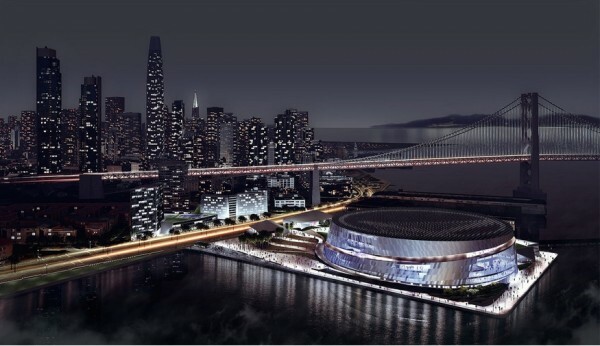 Designed to replace the team’s existing home at the Oracle Arena in Oakland when the lease expires in 2017, Golden State Warriors’ Stadium is scheduled to debut on San Francisco waterfront site for the 2017-18 NBA basketball season. 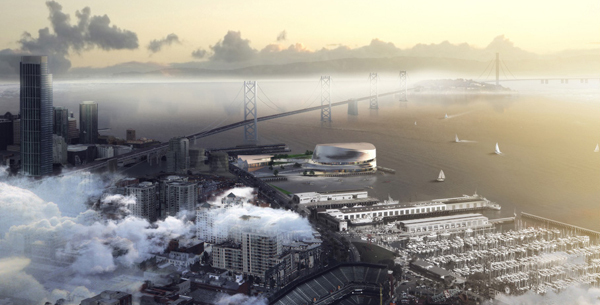 This landmark design will offer expensive open space with the 728.000 square foot arena, along with retail space, ferry and cruise ship access and waterside fire station. 18.000-seat venue will welcome music concerts, conventions and wide range of cultural events. 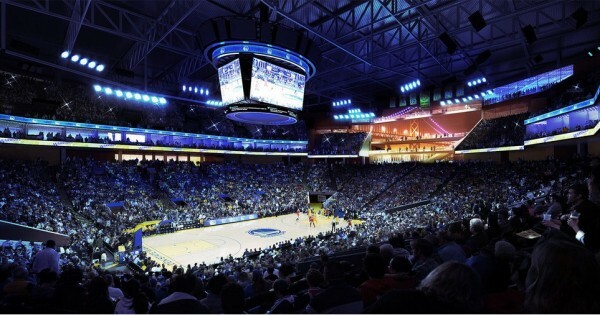 The circular building is wrapped in large areas of glazing around the facade, in order to provide visitors with a view from outside into the practice facility and the arena during games. The large disc-like roof is designed to be covered with LEDs and will be used for the projections. 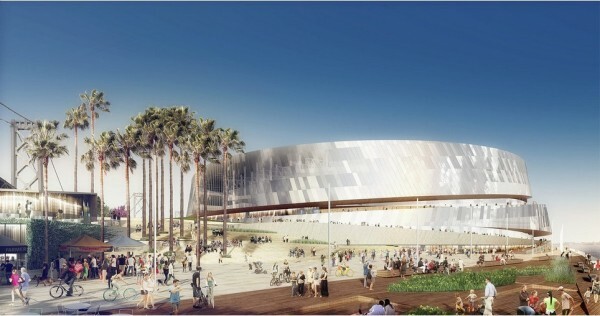 The Arena will serve as a model for a 21st century digital sports and entertainment center, due to its innovative, sustainability and technology oriented design. 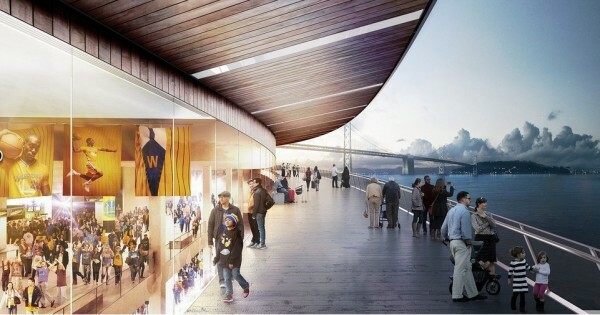 The architects believe that the design lives up to the importance of this very unique waterfront site and it’s a successful compromise between the vision of the Golden State Warriors, the landscape of the bay and the very important community input they have collected over months. 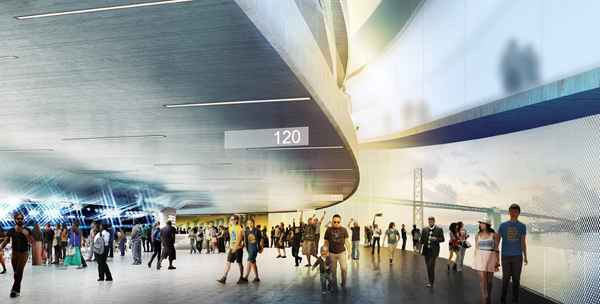 The aim of the architects was to provide a place for everyone – fans, pedestrians, cyclists, tourists, local residents and the diverse community of San Francisco.